Before leaving Hacienda Contreras, I wandered down to Whiskey's tree. I had mentioned a couple of days ago that a bloom had appeared and it looked like there were more coming. Well there was Whiskey's little tree in full bloom just in time for us to say goodbye! Sunday afternoon, Barb and Sal drove us to the village of Ajijic on the north shore of Lake Chapala. Ajijic is a popular ex-pat community in Mexico with a lot of Americans and Canadians who have either full time and snowbird residences there. We left the RV park at about 2:00pm and arrived at our couchsurfing host Cynthia's place in Ajijic at close to 4:00pm. Cynthia greeted us with open arms and within five minutes we were making margaritas with her, which seemed like a fitting end to our time in Mexico! After getting acquainted we decided to go for a walk into the village. We had driven through Ajijic before, but never really walked around town so Cynthia was our tour guide. It was a kind of a hazy day and I wasn't very quick with the camera so the only pic I took was of the church in the central area. The main church in Ajijic. We had one last typical Mexican dinner at a taco stand and went back to Cynthia's place and talked the evening away. We stayed up fairly late even though we had to get up early Monday morning. We actually had no idea how we were going to get to the airport in time for our 9:40am flight. Well, we had an idea but not with total confidence that it would come together! Most of the gringos who live in Ajijic pay a taxi at least 350 pesos ($28) to get to or from the airport. We figured there had to be a way that the Mexicans would do it for a lot less money and sure enough, we were right. We said thanks and goodbye to our couchsurfing host Cynthia at 6:30am when it was still dark on Monday morning and walked across the street to the bus stop. There were a couple of locals there and we asked about a bus that went close to the airport. Sure enough, they said we were at the right spot. Only waited about 10 minutes and our bus came by. The driver charged us 40 pesos ($3.20) each for the hour and 15 minute ride and we arrived at the entrance to the airport at about 8:00am. However, the bus only drops you off at the entrance to the airport. We still had to walk about 15 minutes with our luggage so if you had a lot of luggage this wouldn't be a convenient option. For us, we're travelling light so we were okay. But even then, there were taxis waiting who probably would have charged about 50 pesos ($3.00) to take you to the terminal. We still had lots of time so we chose to walk. Got checked in at Volaris and went to wait for our flight. Boarded at 9:15am or so and the flight took off on schedule at 9:40am. Uneventful flight and landed on time to a drizzly, damp spring day in Chicago! I had done the research ahead of time and it was a simple two train ride ($2.25 each, including transfer) to our hotel, the Best Western Plus Hawthorne Terrace, just a few miles north of the city center. Here's Ruth on the train from Chicago's Midway airport to downtown, and our three bags of worldly belongings for the next five months! We had to walk about 15 minutes from where we got off the train to get to the hotel. Fortunately we missed the rain and it was actually a refreshing walk even though it was overcast. Got ourselves settled into our home for the next five days and relaxed for an hour before going for a walk to explore the neighborhood. Just a few pictures of our complimentary suite for the next five days. First impressions say that this is a very nice place to stay and in a very nice neighborhood. More on that later! Our kitchen...even has a dishwasher. No, not Ruth. An actual automatic one! The bathroom is fantastic. It's about the same size as our motorhome! And the shower is built for two! We wanted to explore the area even though we were kinda tired. We're only a block from the lakeshore so we went for a walk. I think tomorrow is going to bring some really good photos. Some of the older buildings along the lakeshore. The little beach in the picture is actually a dog park! Happy pups can go swimming here worry free! Way to go, Chicago! View south from the dog park at Belmont Marina. Things are GREEN here in Chicago! The Belmont Marina north of downtown Chicago. Along the way back from our walk we stopped at a local grocery store and bought supplies for the week. There are actually two grocery stores in walking distance to the hotel. We're lucky that we have kitchen facilities and breakfast included so we'll be able to keep our food costs down. We have a busy four days ahead of us and we're not telling you about any of it in advance. Okay, I lied. How about kayaking in downtown Chicago? Kayaking? This will be fun! Quite the contrast in two days. Hope the weather cooperates! Nice room!! Have fun and be safe..
Looks like you're going to have a busy few days. Don't get lost in that huge room. Now all settled in and ready to tour, have fun! heh heh a bathroom the size of your motorhome!!! toooo funny! Enjoy yourselves and remember that water temp is still COLD! They had chunks of ice floating in that river just a mere few weeks ago!!! They stopped doing that Karen. The bridge lifts aren't manned any more. They now have scheduled times and days for lifting the bridges. Anxious to hear about the hotel deal. You guys always amaze me with your ability to find the deals. I've never been to Chicago and don't have it in any future plans so I'm really looking forward to your posts. But Kayaking? After our tour here, maybe you will change your mind and will give Chicago a visit after all. So far we are very impressed with the city. BTW the kayaking was great! Love that Whiskeys bush bloomed good bye for you. A sure sign that your new adventures are being approved from above. Your hotel accommodations are wonderful. Enjoy Chicago. We've done a lot of things in Chicago but never kayaking. Sounds like fun! WoW! Let the Chicago trip begin - so excited! So far so good! I hope the weather improves! Nice hotel! So cool that Whiskey gave you a sign to go and enjoy yourselves. Wow that hotel is great, better than anything my company used to put me at, I'm jealous. What a great doggie park, Riggs would love that, no matter how cold the water. Never been to chicago, cant wait for more from you. Whiskey's tree showing you love - so neat! It looks like you're off to a good start in Chicago. 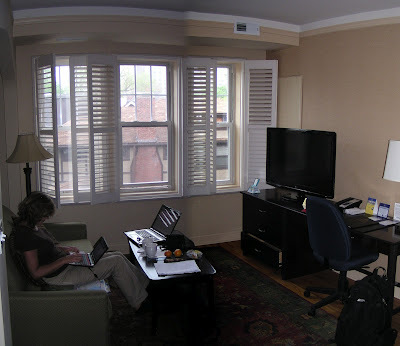 Nice room and great that it's within walking distance of a grocery store and other places. Can't wait to see what you have in store for us! Enjoy!!! OK did I miss how this was a "complimentary suite"?? If so, could you repeat for the non diligent. I do vote everyday though. That's on my google calendar until into June. You are just amazing at figuring everything out ahead of time. Buses, airfare, hotels, campgrounds...... Sure wish you were the captain of my ship. I welled up when I read about Whiskey's tree. So awesome, what a great sign. Enjoy your time in Chicago!!! Glad you had a uneventful flight. The hotel looks like a keeper for sure. Love the header photo. Wishing you two a wonderful time in Chicago. Great start to your trip and have a feeling you have even excelled us in travelling light, reckon I have one more small back full of my years worth of medicines! Actually will be an even bigger nightmare with Steves as well.